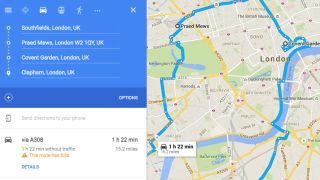 Google has added a nifty new feature to Maps on Android, which will let you set multiple destinations on one trip. While it seems like something that should have been on the app long ago, it's only now rolling out to Android users - slowly, you might not have it yet - and is yet to touch iOS. Once you have the update you'll see an 'Add stop' button which will let you add more destinations to your route. The update is yet to reach TechRadar Towers, but some folks have contacted Android Police to show they've got it running. It seems to be a server-side update, so you won't need to update the app to get it - but make sure you've got the latest version of the app. The option to include multiple destinations has existed on the desktop version of Maps for quite a while, so it's pretty strange that it's only just hitting mobile. Especially as it's something we're going to be using a lot.